Barb – An especially interesting blog entry. Thanks for sharing. Thanks, Barb. I’m glad you enjoyed it. Congratulations on your new bio, Barb! Did you see it is #5 in children’s books on electricity and electronics on Amazon? You sure found the perfect resource for those insightful quotes (what a job that author tackled). No, I didn’t see that, Nancy. Thanks for letting me know. I agree that Michele Albion took on a huge job with verifying all those quotes, and she’s since done two similar books — Henry Ford and Eleanor Roosevelt. You said it well, JJ. 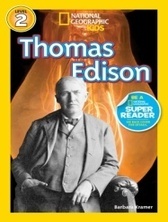 Edison definitely set a good example with his persistence.